A motorhome is a vehicle that also offers living quarters. Motorhomes come in different classes - A, B, and C. Here you'll find the most popular class C motorhome offered today - the Leprechaun. It delivers innovative features at an amazing value. 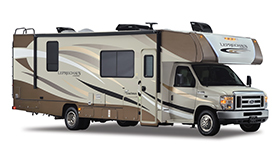 The Leprechaun is a class C motorhome packed with features.